In 2007 I was charged with two separate DUI offenses. The first one that I had ever received was in March and I got a second one in October. I received these charges during my own personal time off from work. At the time I was a driver for a beer distributor, ironically. I didn't report back to work because I was certain that I would be fired, after all I was unable to perform the job for which I was initially hired. Since then, I have had much difficulty finding a job, and it is extremely depressing. I have a family to support, and I am desperately seeking any help that I can get. I'm guessing that your license has been taken away. Your career may be over and it may not be. I'm going to suggest two things. First, I suggest that look into a Certificate of Rehabilitation. A Certificate of Rehabilitation is a court order, which declares that a person who has been convicted of a felony is rehabilitated. If a petition for a Certificate of Rehabilitation is granted, it is forwarded to the Governor by the granting court and constitutes an application for a pardon. Then you want to look into a Certificate of Good Conduct. The purpose of is is to provide evidence that you have been rehabilitated for employment and other purposes. It shows you are a law-abiding citizen and fully rehabilitated. It has no other legal effect. These certificates are not available in all states. It would be a good idea to contact your local legal aid office where you may get assistance at a low cost or even no cost. I was convicted of felony DUI in 2008. It cost me an excellent job at Pacific Life. I went to alcohol treatment on my own accord, 6 months prior to sentencing. December of 2008 I landed a systems tech job at First Data Corporation. I worked there for over 11 months before being downsized November 2009. FDC was aware of my record, and the downsizing had nothing to do with it, it was just a numbers game. I have been unemployed since. I understand the market is tough, and friends and relatives who work for large companies say that employers can be extremely picky in the hiring process now. I'm running out of hope that anyone will hire me. I haven't been able to land a job at a grocery store, fast food, anything. I do a lot of online applications, and wonder if the disclosure regarding felonies automatically flags the app and disqualifies me. The felony DUI is the only thing I have on my record. I had a couple speeding tickets in high school and college. I've never stolen anything, or assaulted anyone, or committed fraud. I don't know what to do and the situation is getting very grim. My credit is shot because of the gaps in employment, and that has to hinder my job search as well. My resume is attached, just for the heck of it. It shows that I've always been employed, for long periods of time, with some good companies. I'm currently on unemployment, which I absolutely hate having to do, and that will run out by the end of July. I have barely been able to make it, and once that runs out, it's curtains. My father suffered a heart attack a month ago, and his medical bills are piling up. I need to be able to help my family but I cannot. I'll also be in danger of losing my house. If that happens then I am done for, as my credit is so bad I won't be able to get an apartment, let alone another house. Is there anything I can do to get past this felony and land a solid job? I've had offers to work at bars/restaurants as either a cook or door man, but cannot accept those because my probation does not allow me to go to bars or be around alcohol. Even a job at a convenience store is not possible, because I would be handling alcohol. Lawn services won't hire me because they require a clean driving record. I have a lot to offer, and am the best teammate, worker, whatever, a business could ask for. In 9 months I've had one face to face interview and 3 phone interviews, nothing worked out. I'm on Career Builder, CareerLink, and Monster, all my information is out there and I apply for jobs daily. All I need is a chance. Any information, advice, would be greatly appreciated. I have a few suggestions for you. First of all I suggest that you contact an attorney. Try legal aid. You should look into perhaps having your original conviction downgraded if possible. I'm not sure what state you live in but you can also look into a Certificate of Rehabilitation. A Certificate of Rehabilitation is a court order, which declares that a person who has been convicted of a felony is rehabilitated. If a petition for a Certificate of Rehabilitation is granted, it is forwarded to the Governor by the granting court and constitutes an application for a pardon. Often a little legal assistance makes it easier for convicted felons to get jobs. Thirdly, I suggest contacting your local United Way office. 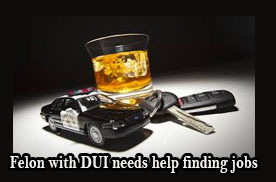 United Way supports a number of social service agencies that offer assistance to ex-offenders and felons some with DUI. A person with your education and experience may even be of service to one of the many organization it serves. Three years ago, I was arrested for a DWI with child under 15. It was a difficult case because there was a lot of circumstances surrounding the case. Gastric bypass, anxiety meds consumed, etc. Anyhow, DA pursued prosecution but found a loophole for Deferred for me on this felony. Just in time before legislation closed. Three months before they did actually. Anyhow, I served my two years probation and it ended without incident. I was able to find a great job while on Deferred but only because I knew the person. I had to quit my job due to personality conflict and now I cannot find work anywhere. It is already embarrassing enough to have this charge on my record being a mother, a college student, a respected individual. But now I can’t seem to find work. I’ve applied everywhere and most places tell me I’m overqualified. I can’t get it non-disclosed because it’s an enhanced form of child endangerment. That’s what SOME lawyers say. SOME lawyers say I can. NO lawyer has EVER had a case like this so they don’t know how it would go down. Afraid to waste my money over and over again while lawyers make mistakes trying to figure it out. And then I input the details it asks to explain. 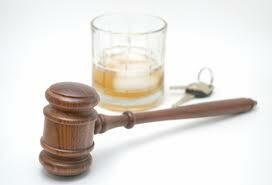 Why IS it so hard to find work for a woman with a DWI? Especially a felony? If it was a man, they would just shrug it off like no big deal and hire them up and shake hands and head out to the bar for a drink. It’s such a double standard. I’m a good person. I work hard. I’m dedicated to what I do. I made a mistake. Even the justice system saw that there was circumstances surrounding what happened and gave me a break. They could have thrown the book at me, but didn’t. Why won’t employers cut me some slack. Perhaps you are disclosing too much information and scaring employers away with your explanation. I encourage all ex-offenders and felons looking for jobs to only disclose what is asked...no more! For each application you complete, pay careful attention to the wording. Most applications ask about convictions and not arrests. In reference to your deferred adjudication, you must consider the conditions of your deferment. In most cases, when the conditions are fulfilled (usually a fine and probation,) the original charges are dismissed but they remain as charges not convictions. Anyone accessing your record (other than law enforcement, the court system, and government agencies) will only see the charges. For more clarification, contact the prosecutor in your case. My sister is a convicted felon for the 2nd time for DWI's. She lives in Angleton, Tx. She is a hard worker. She has mainly done construction throughout her lifetime but she is getting too old to continue this type of work. She has been to the WorkSource numerous times and she continues to look for employment; but she is getting really discouraged. I have been online to find a list of company names that hire convicted felons and have now wrote them down. Is their anything else you can think of that might help her seek gainful employment? I'm sorry your sister is having so much trouble. The good news is that people with DWI get hired everyday. 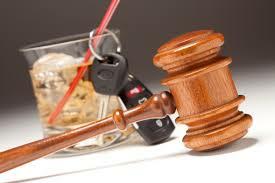 It is my experience that people with DWI tend to have more success finding jobs in the retail or hospitality industries. Employers in these fields want people who will be reliable and punctual. Don't give up on the WorkSource in Texas. New positions are added everyday. A counselor can show you how to browse open positions from home if your are not already doing so. One last suggestion, when you find an opening you like, the absolute worst thing you could is to lie on a job application your charge. I would just be completely honest and in the interview explain the situation to the employer.